A proposal by the Carpionato Group for 776 parking spaces and 459 residential units at 100 Harris Avenue (aka the Old Fruit and Produce Warehouse) is on the City Plan Commission Agenda for their meeting on December 20th. Have we forgotten that this was supposed to be an historic rehab? This city is about to (possibly) about to explode with cranes. Exactly what that street needs! +1,000 residents walking distance to downtown! So much happening, the next decade is looking bright for PVD. It seems like this plan requires cutting off the last little bit of Harris avenue for a ten-space parking lot and some trees. It’s a redundant bit of road, but still, it’s a bummer to see it go for parking, and it also makes the walk to the mall a bit inconvenient if you’re walking on that side of the street. It also looks like the useless bit of land at the end of the 903’s lot would be shaved off for this arrangement, though I’m not sure if this has been worked out with them, or if that land belongs to the city. All in all, I can’t say I have many issues with this. Like you said, there’s not much going on there in the first place. A five-story and a seven-story structure spanning this much land is a nice addition to the neighborhood. I slapped together a quick overlay to get a sense of scale. This news is exhilarating like before the housing bubble. Hopefully those cranes are raised! Harris just gets tee’d into Kins- er, “Providence Place” for a safer, less highway-ramp-like intersection than what’s there now. The walk from Harris to the Mall looks to be about 70 feet longer because of the realignment. I’m starting to think that maybe the superfluous amount of parking might be in anticipation of a possible third building. That little park on the western end of the property seems terribly out of place to me. Every time I look at it, I keep wondering who the hell it’s really for, since I doubt they’ll be super friendly to non-residents hanging out there. This is definitely wild speculation on my part, but I think there’s the hope that if these units fill up within a short enough time span, we could see an additional seven to nine story building on that last stretch. With a smaller footprint, there’d be less room to fit many parking spots per floor, and they might just aim for an even space to unit ratio. It’d fit within the context to have a nine story building there too. The eastern building is five, middle is seven, this is right up against an elevated road, and on the other side of the tracks/highway is a seven story JWU building on higher ground. Of course, this is Carpionato, so who knows? It took about a decade for this to be proposed, when (Yes, Jen, I remember!) this was supposed to be a rehab in the first place, and then a Best Buy (basically). I personally love buildings built right on the highway. I was very excited for the original Aloft hotel proposed for West Exchange because it added some life, height, and density to the other side of 95 — I hope that proposal is revived in another form, but this is a step in the right direction. On this board, people mentioned a “canyon effect” that would be created if we added buildings/high-rises on the West side of 95, this isn’t quite the height I was looking for… another 5 stories would be ideal, but the increase in visual new builds from the highway is very good for the City. I love driving on 95 and seeing the “PROMENADE APARTMENTS” changing LED sign. I want more of that urban residences feel. Is the off-ramp being decked over with a park? There is a lot of development opportunity on Harris, but it looks like the path forward is residences without much (if any) ground level retail. This isn’t the best place for it, but there will be a lot of residents in a concentrated area. KCB – No, they’re not capping it, they just colored it green here so we wouldn’t be distracted by the fact that there is a giant highway ramp between the buildings. mp775 – Well, upon closer inspection, there is a little walkway, though it forces you to cut through the parking lot, and leave through the driveway. It may not be ideal, but I suppose it’ll have to do. I’m sure they’d rather not have non-residents walking through there, but hey, that’s the reality of the situation when you remove the most direct path. It’s big, adds residential density, and fills up a troubled site surrounded by highways and rail lines, a highly visible site that’s a bit of an oddity, being both very central TO the city yet also very disconnected FROM the city. Whatever, man. Go for it. Anyway, this beats the hell out of that horrendous stripmall Best Buy proposal. Bigger problem here — and I hate to be this guy, but — is that it’s Carpionato. Lots of ambitious pipe dream proposals over the years, but do they really have the chops to pull off a project like this? Browse their portfolio, if you need to. Not very impressive. “A majority of young people are looking to partake in urban living,” Pierik suggested. At the same time, he added, young people increasingly are living without a car as the social appetite for ride-sharing, mass transit and biking has grown. Then why are you building 1.7 parking spaces per unit? So Carpionato Group reckons its target market is the 21-to-30 age bracket, plus empty-nesters from the suburbs and Boston commuters. I reckon most 21-to-30 year-olds do not want to live in a parking garage behind the mall. But I could be wrong. Harris Avenue would be narrowed in accordance with a long-standing agreement between Carpionato Group and the city, from its present 40-foot width to 32 feet. There would be 12-foot travel lanes in both directions and an 8-foot parking lane. If there are 776 off-street spaces, and no retail, then there need not be any street parking. Harris should be two 10 foot auto lanes and two 6 foot bike lanes. Also, why did this agreement to give up right-of-way ever happen? Asked if Carpionato Group seeks financial incentives from state or city government in order to build, Pierik was mum. But he noted that it is especially expensive to build structured parking. If structured parking is so expensive, then don’t build so much of it! If its so expensive to build parking, why not market it as a pedestrian/urban living development and spend a fraction of the enlarged parking structure on an indoor catwalk/tube/bridge directly to the mall. The “Promenade District” should be connected *safely* to the Mall/Train Station/Omni/Convention Center/Dunk without having to go outside. It makes everything in that area more marketable, and valuable. They could also keep roughly the current plans and build up on the highway side of the development, additional levels could be units with no parking allocated. They are putting a premium on every unit because of the parking spot. They could even be smaller, “micro apartments” like the Promenade added. They add density and scale without having to add any amenities. Plus, it would block part of the remaining structure from the interstate. People living in those units want to be on the highway, without parking, close in proximity to downtown and the Train Station. Also, from 95, drivers should see urban looking high-rise buildings, not low-rise townhouse complex looking structures (if they will be able to see it at all). 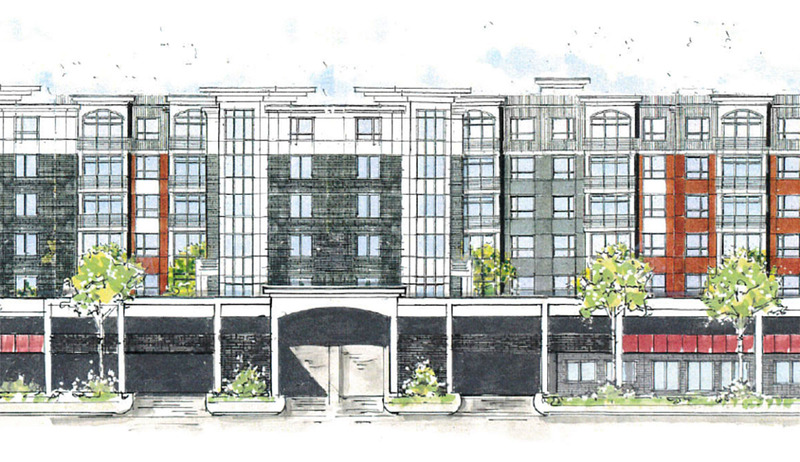 This is a 459 unit development — why not fit it into the lot closest to the highway and build it much higher! I know everyone thinks that this will just get greenlit really quickly — but I want to see some pushback to make it higher in elevation. They are building a stick frame over concrete podium structure. Current building regulations only allow that kind of structure to be 6 stories tall. If they went any higher, they would have to build a different type of building which would change the economics of the project. It is not impossible, it is just a completely different building. The Harris Avenue public sidewalk in front of the main building near the intersection of Providence Place (aka Kinsley Av) vanishes into a circuitous serious of private walkways culminating with a jaunt across a small parking lot entrance (presumably for visitor parking for the leasing center). Not very public, but then unless it’s just to walk the dog, who walks on sidewalks. For residents, the elevator(s) are attached to the buried garage, a bit of a hike to the lobby if you’re planning to walk to one of the adjacent buildings (903 or Promenade), the mall or downtown. The developers assumption must be that residents drive everywhere always. If you were to live in one of the apartments towards the western edge of the building, it’s a very long walk (several hundred feet) from the garage or to access the street. What is the status of this — 459 residential units at 100 Harris Avenue (aka the Old Fruit and Produce Warehouse) ? ?